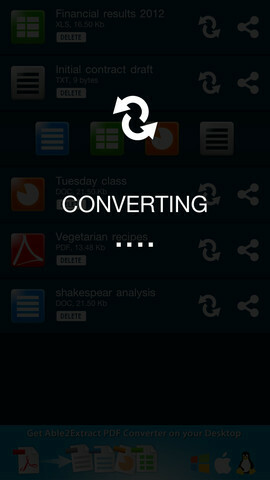 This week’s winner of our Free App Poll is Able2Extract PDF Converter by Investintech! This free, lightweight and easy to use app available in productivity category lets users create and convert PDF documents with on their smartphones effortlessly. Providing accurate and high quality conversions on the go, Able2Extract PDF lets you easily create and convert PDF files to and from editable Microsoft Office documents right from your iOS phone in just two simple taps, and unlike other mobile converters – and these all available for free! b) Choose Open in Able2Extract and the file will be added to the Able2Extract ¬file list. The second step is to convert the chosen file via tapping on the conversion icon and once the list of format conversions is visible, tap on your desired conversion output. Converted files are kept on your phone’s storage system until you erase them, allowing you to easily share, preview, or use them in other apps. The smooth interface makes the conversion process simpler down to just two taps discussed above. For guaranteeing user privacy, the files that you convert are deleted from the app servers in 24 hours and are never used for anything else other than for the conversion process. Able2Extract PDF Converter is available in Apple App Store and is compatible with iPhone 3GS, iPhone 4, iPhone 4S, iPhone 5, iPod touch (3rd generation), iPod touch (4th generation), iPod touch (5th generation) and iPad running iOS 4.3 or later. This app is optimized for iPhone 5.